Court-ordered but rightsholder-controlled ISP blockades have reportedly led to a second case of wrongful website blocking in a matter of days. Late last week TorrentFreak.com was blocked following Sky’s automated response to an EZTV DNS change and now a second site has fallen victim. According to an industry source, in calling for a site blockade rightsholders failed to check some basic information which led to the wrongful blocking of RadioTimes.com. To celebrate its 10th birthday, last Saturday The Pirate Bay released a new anti-censorship tool. Called PirateBrowser, the tool allows Internet users to unblock websites that have been rendered inaccessible by governments, rightsholders and Internet service providers. As of yesterday the software had been downloaded a highly impressive 100,000 times, a clear indication that people not only disapprove of website censorship but will also take measures to circumvent it. While The Pirate Bay is highly censored in many countries, other sites are also affected, including the TV show-focused EZTV. That site was blanked out by the UK’s leading ISPs following a court order obtained by the MPA, and last week that particular blockade caused its first instance of collateral damage. After EZTV experimented with its DNS settings pointing them at TorrentFreak.com, Sky Broadband’s systems automatically blocked the site, rendering it inaccessible to the ISP’s four million customers. The company eventually reversed the block, but despite the warnings it appears that yet another site has been wrongfully censored. On Monday it was reported that RadioTimes.com, a TV scheduling site, had become unavailable to users of both Sky-owned Be Broadband and Virgin Media in the UK. Today there is confirmation that the problems were down to ISP anti-piracy filters failing again. According to PC Pro, the problems were not caused by an EZTV-style DNS issue, but a long-feared problem – that sites with shared resources would be all fall victim to overbroad blocking. 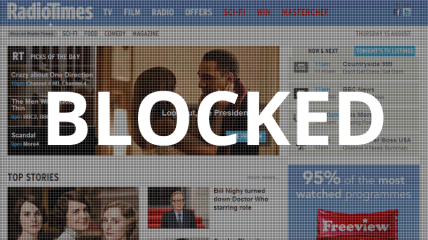 An industry source confirmed that rightsholders did not check whether the IP address they called to be blocked was being shared by other sites. As a result, RadioTimes.com went down as collateral damage. Neither Sky nor Virgin Media officially confirmed what had caused the problems, but did say that the blocks had now been lifted. According to the Open Rights Group, Sky operate a blocking system codenamed “HawkEye”. Let’s hope the system can live up to name in future – with a little help from improved rightsholder caution. Update: According to the BBC the problem lies at the feet of the Premier League. When trying to have an IP address of streaming sports site FirstRow Sports blocked by ISPs, the UK football outfit failed to notice that many other sites shared the same IP address. Now the blame-game is on, with the Premier League blaming the ISPs for not indicating they had a problem with the block, and the ISPs insisting it’s the Premier League’s responsibility to ensure that the provided IP addresses only relate to blocked sites. Protip: Both act responsibly and stop blocking sites without checking these things, it’s literally a two minute job.